Putin understands Russia will have to seek peaceful and friendly co-existence with Beijin. Everyone is trying to guess how Russia’s foreign policy might change after Vladimir Putin takes over as President. Most expect Putin’s Russia to resume its anti-Western policy. In this respect, it is symbolic that Putin’s first visit in his new capacity as future President was to China and that, in his first keynote article, he offered to create a Eurasian Union of ex-Soviet nations. Yet these might be just coincidences. The visit had been planned long since and the article, judging by its style and genre, had taken some time to prepare. And generally, the question of how the ‘western’ and ‘eastern’ combine in Putin’s vision is much more subtle and complex in nature. To begin with, in the eyes of observers, Putin-2 of the second term (2004-2008) completely overshadowed Putin-1 of the first term (2000-2004) with his strongly pro-Western agenda, from close cooperation to prospects for European integration and concessions to the United States (the closure of military bases in Cuba and Vietnam, loyal position on Central Asia, etc.) and advances to Tokyo on settling the Kuril problem. The result, however, was disappointing. Who should be held responsible for those failures and to what extent is a question open to debate. On the one hand, Putin may have lacked some skills and patience in demonstrating the sincerity and earnestness of his intentions and, on the other hand, western partners may have been reluctant to make concessions, hoping that Moscow would sooner or later give in, accepting what the West had to offer. And yet, in retrospect, one can hardly blame Putin for not trying to bring Russia into the western orbit during his first term. The lack of the desired result (or rather the opposite result) shaped Putin-2 as the author of the anti-American speech in Munich. The foreign policy message of Putin’s second term was: so you don’t want to treat us like equals? Then I’ll make you! And he did. What was the role of the Eastern pallet, especially China, in Russia’s foreign policy of the 2000s? The early Putin, despite his multi-faceted approach, was largely pro-Western in the sense that Moscow’s foreign policy was focused on ties with the US and Europe, which could be good but sometimes not so good. At the same time, Russia was also building ties with Asia, especially China and India, creating regional structures of varying cohesion, from the Shanghai Cooperation Organisation to BRIC. At that time, most commentators focused on how this activity would impact on Russia’s relations with the West. And that was right: Moscow was making it clear to the United States (in terms of military and political activities) and Europe (in terms of energy) that it had alternatives. At some points, the West believed it and expressed concern; at others, it would just brush Moscow’s claims aside. There is still a tendency to see Russia’s Asian policy as a means for putting pressure on Europe. Yet this has become irrelevant for one simple reason: whatever Moscow’s relations with the US and Europe, China has emerged as Russia’s major neighbour, wielding a strong influence and likely to wield an even stronger one. Moscow simply cannot afford to have not very good ties with China and not to develop a balanced eastern policy, irrespective of its ties with Washington. Vladimir Putin is not one of those who is fascinated by China and he is fully aware of the risks inherent in the rapid and very impressive growth of the Asian neighbour. But he also understands the true state of affairs. First, Russia will have to seek ways for peaceful and friendly coexistence with Beijing. Second, there is no another growth and development engine in Asia that could rival China. 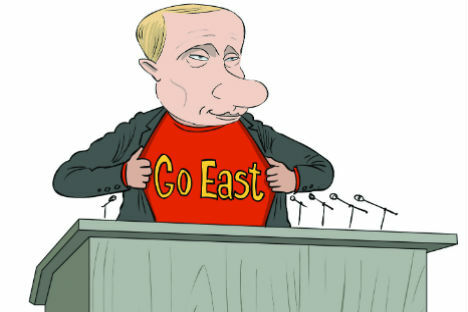 Finally, if Russia wants to upgrade its Far East region, it cannot do so without China. Another thing is that lofty phrases about modernisation and technological alliance with China – which is a new topic apparently inspired by Putin’s visit – in practical terms mean institutionalisation of the existing model: Russian raw materials in exchange for Chinese products. The issue is the conditions, not the essence. Speaking realistically, however, instead of dreaming about Silicon Valleys, Russia should go ahead with real modernisation, focusing on efficient use of raw materials and market diversification, in terms of both geography and product range. In other words, it is not the US and Japan that should be chosen as models but rather Australia and Canada, as highly developed nations with their growth based on natural resources. In this sense, China is vital, with its steadily growing consumption and significant excess cash. Even so, the Chinese are tough negotiators and Russian officials have learnt that now, remembering with nostalgia the stubborn Ukrainians and noxious EU officials. But there is no alternative this time. Vladimir Putin has made no secret about his view of hydrocarbons as Russia’s main resource and guarantor of political weight throughout the 21th century. Out of caution, Moscow chose to abandon its slogan of being an energy super power (funnily enough, it was picked up by Canada), but the essence has not changed. Unlike in Europe, where Russia has been pursuing a pipeline diplomacy and policy since the 1960s, it is only beginning to feel its way in Asia. One such overture is Moscow’s recent proposal that Pyongyang become Russia’s main partner in constructing a trans-Korean gas pipeline, in exchange for a rethink on the nuclear programme and a peaceful settlement. Yet Russia’s ability to promote its goals in this way is rather limited: unlike in Europe, where Moscow has a solid footing, it is only beginning to gain political weight in Asia. But there is no other way. Putin’s visit to China, in his new capacity as future President, turns a new page. His next term’s agenda will be dominated by efforts to develop a model of peaceful coexistence with Beijing – one that should work for decades. Soon, commentators will have to change tack and stop seeing visits to Beijing in the light of Russia’s ties with Europe and the United States. Rather, they will consider whether Russia can use its contacts in the West to strengthen its position in China.